Davam Urgent Care is a health clinic located in Magnolia, TX. Our clinic services the nearby areas of Conroe, Montgomery, Magnolia, The Woodlands, Tomball, and Spring. We are also conveniently located near the neighborhoods of Woodforest, Jacobs Reserve, Alden Bridge, Grogans Mill, Creekside, Indian Springs, Westwood, and more. 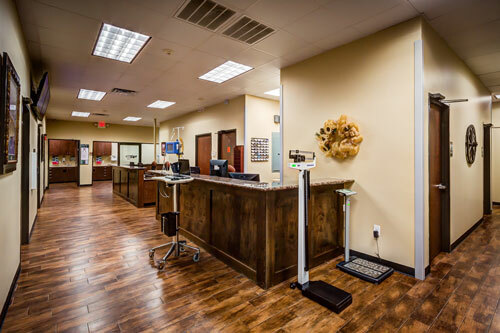 With convenient hours of 8am-9pm, 7 days a week, we are the go-to health clinic in the Conroe area. Conroe, TX residents turn to Davam Urgent Care when they are in need of after-hours care from a board-certified medical provider. We are proud to have over 700, 5 star reviews and to be the first accredited urgent care in the community. Urgent Care– Davam provides care for non-life threatening injuries and illnesses, 7 days a week. Urgent care services include sinus/cold treatment, flu treatment, allergy treatment, uti treatment, splinting, dehydration IV treatment, sports injury repair, and more. Workers Compensation– We can treat on the job injuries and are in-network with most workers comp insurance plans. The most common on the job injuries include back pain, animal bites, laceration repair, and wrist pain. X-Ray– Our clinic will always have a certified Radiology Technician on-site. We offer the latest technology in digital x-rays. On-site Lab– We offer many on-site labs including rapid drug screen, urine testing, CMP, CBC, flu screen, strep testing, mono, RSV, EKG, cardiac enzyme, and many more. If you are suffering from an illness and in need of a health clinic located near Conroe, contact Davam Urgent Care located at 6022 FM 1488 in Magnolia. Don’t forget to check-in online to reduce your wait time.